Crop Choices: What To Grow? Laura Beth: top 10 favorite foliages for wedding work? Olive: I’m so lucky to have this growing on the property where I farm. It always looks great (except for early spring when the tips are tender), and creates such nice graceful lines. 2) Elaeagnus: A new favorite for me! I just planted some on the property after buying it in for every wedding last fall. It’s like olive with bigger leaves and they have these stunning gold under-sides. Never wilts. Magnolia: I first started to appreciate the brown undersides of the leaves, it’s so hard to get that brown/tan/dried look sometimes and magnolia is key. It’s also just so BIG. I used to use such small, dainty greenery that covering an arbor or a big arrangement took SO much work and material. Then one day it dawned on me: use bigger things! Why did it take me so long to figure out? You can practically cover a whole arch with just a few branches, and it looks stunning. My apologies to the nursing home where I forage the magnolia. But man, those trees need pruning! Abelia: This is another one that’s so nice because while being beautiful, it also just takes up so much space in arrangements! It holds up great out of water as long as it’s old enough to have flowers formed, and the flowers do tend to fall off, but no one really cares. I used to forage this from the Whole Foods parking lot before I planted my own. Jasmine: I’m guessing I’ll get sick of the look of jasmine and how it’s kind of over-used (just like Silver Dollar Eucalyptus), but it hasn’t happened yet. I love it and want it in everything. Honeysuckle is a close second for me. And clematis foliage too, though I’m trying to be a little more scrappy than that. Mountain Mint: Last year was my first season having this on the farm in any abundance, and it took forever for it to be hardened off enough to use. I love it but I’m still figuring it out. Namely, you have to wait until the flowers are so well formed that they’re turning brown, but in my mind if you wait too long they look a little dead. Hmm. Raspberry Leaves: Except in small quantities, I’ve had to buy this in from other local farms. I absolutely love the look of the leaves in arrangements, and it holds up really well. It’s a staple in early season weddings. Eucalyptus of some sort: A little seeded euc goes a long way. Later in the season I use my Silver Drop in arrangements, too. Bupleurum: This is one of my favorite seeded annual greeneries. I don’t think I’ll ever stop loving it. I don’t love growing it, though. On my tiny farm it doesn’t make too much sense to grow these cheap one-and-done varieties. I can buy it for $6/bu from friends with bigger farms that grow beds and beds of it. So, I do. Atriplex: You know, I grew this years ago and liked it but didn’t appreciate its true value because I wasn’t doing weddings at the time. Now I’m thinking of adding it back in to the mid. The texture is amazing, and that burgundy/dusty pink color will come in handy late in the season. Andrea: I know this isn't one of your three listed topics, but how about talking about the small urban farm aspect: How do you decide what crops merit space on your small farm? Do you allot space to any perennials; if so, which ones? Did you have to get permissions from your city/town to have your farm? And, if you are willing to share this much, what kind of earnings/profits are you making off your small space? Thanks in advance! This is a great question. For my model, at this point, I grow a little bit of a lot of things to use in my own design, and then a lot (relatively speaking!) of a few things to sell to other florists. For all of these crops, they first of all have to grow well in my area and in my soil. If I can’t seem to get the hang of something after a few tries, I’ll give up on it and focus on what seems to grow more effortlessly. They all also have to do ok in the hot sun in wedding arrangements because I do so much work that has to sit outside. I’m constantly pulling things from the crop plan that wilt easily. And finally, I’m moving away from ‘one cut wonder’ flowers and heading more into crops that bloom over a long window. The reason is that I’m sick of digging and flipping beds. Even though on a bigger scale the money would be in the quick turn-around, for me I’d rather do less work by hand and plant fewer successions. For things I use in my own design, they have to a) be useful in many different applications and events, b) be a color that’s popular right now (I don’t grow much yellow or orange but I bet this will change), c) be either a staple crop that I’ll use a lot of each week or a stunning focal flower that will ‘make’ an arrangement. For things I grow to sell to others, they have to either be so highly in demand in the local market that I can sell every stem even if other people are growing them, or sort of rare in that no one else near me is growing them on any kind of scale. For me right now these things are dahlias, lisianthus, Japanese anemones, mountain mint, foxglove, ranunculus and anemones, and roses (sort of). Janet: What is your most important crop? I’d say that in the past few years, dahlias have been a staple I couldn’t live without. Although everyone around me grows them and the prices I get aren’t too competitive ($7/bu to florists), I can always sell every stem, and they’re something I can count on to make any arrangement pop. Cassie: What have your "experiment" wins and fails been and what are you still trialing or working through and is TBD? Fails: baptisia, just doesn’t like this climate! Poppies in early spring have had really bad bug pressure so I’ve mostly stopped trying. Scented geranium has a hard time hydrating for me even though I usually grow it in abundance. Wins: peonies in spite of people saying I don’t get enough cold for the, sowing seeds at odd/wrong times of year and just seeing what works out. TBD: Covering beds with plastic in winter to keep rain off, planting things earlier, bearded iris in large quantity. Rita: What new crops did you try in the last couple of years and will be keepers that you will grow from now on? Japanese Anemones! I’d long loved them, and once I got some encouragement from Jennie Love I went big (for my little farm) and planted a 120’ bed of white and one of light pink. I knew no one around me was growing them, so i could plant a big block and sell them all. And I was right. They took a year to settle in and then bloomed their butts off. I did have a little trouble with them though. For one thing they really need to be conditioned, and they drink water at an alarming rate. And as my season went on, they experienced some bug damage. It didn’t even happen until I had been selling them for about a month, and then one week I had a huge, busy week of sales and must have let my quality control slip. Because I was harvesting them so early and closed, I wasn’t able to see the bug damage that became apparent once their petals unfurled. For weeks on end I had been using them in my own designs (and on my kitchen counter) with no damage to speak of, so I wasn’t expecting it. You can imagine my embarrassment when I got a call from a designer in SF saying that they couldn’t use most of them! Other new crops...columbine, mountain mint, sugar stars phlox, supreme cantaloupe echinacea, love in a puff (if I can find a better way to grow and untangle it). Christy: a list of 5-10 crops that a) florists like to buy, b) hold up well out of water, and c) are profitable growing and selling on a larger scale. I had to think about this one for a minute. Kind of a random list but I think they all fit your criteria. A fun challenge! Selling Flowers: How What Where Why Who? Cassie: Tips to balance sales outlets....when you have a wedding coming for the upcoming weekend, how do you decide what to make available to florists or other outlets. I haven’t figured out the perfect solution yet. Honestly two years ago I figured out how to crank out flowers to sell to florists, and last year I really figured out weddings. Maybe this will be the year to do both really well. In general, I tend to just really reign it in during big weddings weeks. I overestimate the number of stems I’ll need for my weddings and take large portions of those crops off of my availability lists for that week. It’s not very efficient, to tell you the truth. Let’s say that someone placed an order for 10 bunches of white dahlias on a week when I need realized that I need white dahlias for a wedding. Since I sell on Tuesdays or Wednesdays, I do have the benefit of being able to pop back into the field on Thursday or Friday to get more white dahlias for my own designs that have bloomed late in the week. Sometimes that means I’ll even alter my design process and go ahead and make the base for my centerpieces, for example, and then pop in those focal flowers later in the week. Like I said, this part isn’t efficient, but it does ensure that I can a) keep the same things generally available to florists week to week (even if in smaller quantities) and b) use up those flowers that bloom later in the week. I’m also finally building a flower stand on the farm to be able to sell those flowers blooming Friday and Saturday (starting harvest on Sunday for sales Tues, Wed). Jennifer: When you are growing for weddings and planning your crop schedule, how much "overage" do you anticipate? For example, if you know you need ten bunches of snaps for your May wedding, do you add 20% (or some other figure) to that in case of pests, weather fluctuations, etc. and then plant extra rows? I’m actually way less exact than that. I grow things that I know I like to use in designs, that are timed to bloom at appropriate points in the season, and yes, that correspond with certain weddings if I can manage (and if the wedding was booked early enough). So if I have a wedding with 20 centerpieces and I’d love to have 3 foxgloves in each, I’ll try to plan to have more than enough foxgloves to be blooming on that date. But come time for the wedding, I’ll harvest all the foxgloves I have, and then fill in with something similar such as delphinium or snapdragons. I don’t care at all that each arrangement be totally uniform. If it’s really crucial, I’ll buy in some white foxglove from another grower. I think trying to grow a certain amount at a certain time for a certain wedding would give me a heart attack. The more I can work on my design skills to be able to make any combination of flowers look beautiful and match the couple’s general vision, and keep packing my field with a diverse crop plan, the better I’ll do. For sure. Really work on a) creating a process that works for you, and b) responding to the kind of demand you’re experiencing. If you get inquiries over and over for just ‘mixed wildflowers’, create options for a ‘grower’s choice’ bucket, whereas if you keep getting requests for certain colors and types of flowers, create a system that easily shows them what’s available. Make sure you’re charging more than you would be charging to florists. And make sure it makes you money, If you’re spending lots of time answering phone calls and emails from nervous brides and fretting over what you’ll have for them, you need to refine the system. There are lots of people out there who have figured this out. Joan Thorndike, AJ Kocon, etc. Search or facebook for past posts. Becky: Any advice on how to sell to brides this year with having no photos/feedback of my flowers? I’m thinking of doing a 1/2 price bucket option where brides can get a 5 gallon bucket of what is in season for a cheaper price. Calling it a “first year special” or something along those lines. Thoughts? Ooh, I do have thoughts! First of all, I would make sure that you’re not undercutting other local farms or florists. I know this isn’t your intention, but I find this often happens with newer farmers who are unsure of their product and market, and just want to sell. “First year special” implies that because you are a newer grower, your flowers are going to be cheaper than other peoples. They shouldn’t be. I can also tell you, if you’re trying to market to people looking for a bargain, you’ll never have the customer you want. (I do think that we should have flowers for every price point. But that’s another story). I would think of it more like this. Create a high price for buckets of flowers where they get to choose the colors/varieties, and then the more normal, baseline price is the ‘grower’s choice’ bucket (or what you’re calling ‘½ price’). People will be excited about your flowers and you’ll start building reviews and photos, but even in this beginning stage your prices shouldn’t be low. If you want to give your customers something special, advertise that you’ll add in an extra bunch or two with each order. But set your prices competitively high. And find a way to do some simple photoshoots! They don’t have to be fancy. Good luck, I’m sure this season will fly by and you’ll learn a ton. Kelly Jo: Any sure-fire tips for marketing to florists? In the beginning, call your target florist, be concise and tell them what you do, and offer to email or bring by a general list of what you’ll be growing, your general price range, and when it will be available. Then ask they what their systems are: when they like to order, what they can imagine buying from you. Then check in with them as the season draws near, letting them know what’s coming on. After than, suggestions below. Quality: make sure you never bring them sub-par product. Always under-estimate: it’s better for your long-term relationship with that florist if you lose a few bunches of potential profit rather than promise ten bu when you only have 5. Consistency: check in with them every week about what’s coming up and what you have to offer. Be clear and concise. Make it easy for them. Respect: don’t be a nuisance: I wouldn’t want to buy 5 bunches from someone who has to ask me 10 questions each week or continually check in about timing. Make a system of communication and stick to it. Confidence: don’t talk down about your product. Flexibility: be open to feedback. Something wilted for them? Offer a refund. Be calm: If you have unexpected bunches, bring them on your delivery to see if they want them, but don’t scurry and lose track of your systems just to try to make a buck. Don’t send a frenzied email saying “I have a huge bed of snaps that all bloomed at once, can you take any more”. Stick to what you offered them initially, bring your extra stuff to casually show them, but don’t make your poor planning (or unexpected weather) their problem. A good florist will support you and indeed help you out when needed by buying extra, but not before you’re built a rapport. Kelly Jo: Can you explain some basic quality expectations/requirements that we need to hold up to? AKA, can you explain the grading system, stem length minimums for a few favorite spring and summer varieties whose stems can vary wildly... tell us what NOT to try and sell because it will embarrass us! My best advice would be to go to a florist or wholesale market and start looking around and noticing what you see. Only bring/sell product that looks amazing. Stem length is a bit more complicated I suppose. In general, I’d say that most florists are used to buying stems that are so long that they easily fit in a 5-gallon bucket. For things like dahlias and zinnias, that’s the length you should be cutting. For things like stock and lisianthus that bloom on short stems if grown under stress, your florist will be used to seeing super long stems on these. So, if yours bloom short (less than, say, 16”), be prepared to offer them ONLY if listed as ‘short’ and reduced in price. This isn’t really an industry standard, just what I do. So, it’s a tricky question. You just have to get to know the product you’re growing. And really, visit some florists of wholesalers to see what you’re competing with. Tina: Info on grocery store bouquet sales. Examples of how to approach the store manager, what to offer,how to offer,how often,pricing. Do they buy let’s say 20‘s bouquets a week out right from you? Do you only get profit from what they sell? Do you have to go in and top off water half way through the week? And also if flowers sit there for a week with customers touching on them and your name is on that, is that bad advertising for us? Do you do bouquet drop offs twice a week? I’m supposed to meet with the store manager in June, earlier he said if I have flowers. But he’s never done anything like this and he’s not even sure what his store policy is. It’s giant eagle so they’re under an umbrella. I watched the one conference video where Pamela and Lisa Ziegler talk about sales. But these questions I just don’t feel clear on. And I don’t have a clue how to approach this. Well, I’ve worked with two types of grocery stores. One had their act together and sold beautiful flowers all the time. 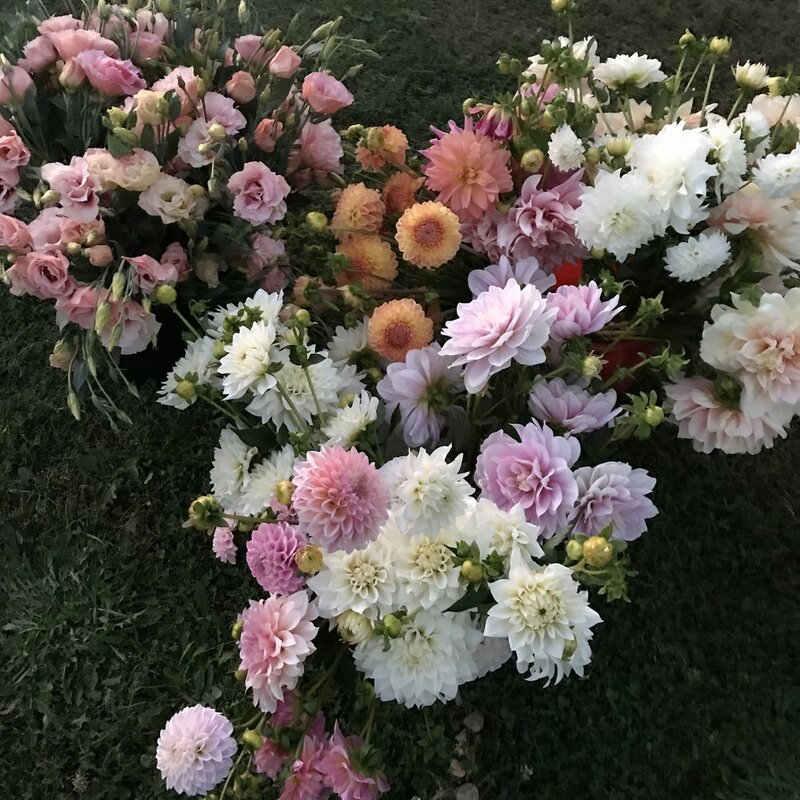 I was one of many farmers who sold straight bunches and mixed bouquets and I never had to worry about the display, about the flowers selling, or anything else. The second was a store that didn’t sell many flowers, didn’t really know how to display and take care of them, and was nervous to buy more than they could sell (which left them far behind the curve because we all know you have to ‘pile them high and watch them fly’). I far preferred the first store, where I was just one of many farmers but I didn’t have to worry about my reputation or about the store not believing in the flowers. Where there is every kind of arrangement under the sun, here’s what I would recommend to you. Be sure to be realistic about how many bunches or bouquets you can really provide, and ask for them to commit to that number each week. I would say 10 bouquets and 10 straight bunches (maybe of two different types of flowers) each week, once a week before their busiest couple of days. They should be responsible for keeping the buckets full of water and for displaying the flowers in an appealing way (near the register if possible, as they’re an impulse buy). They should toss the flowers after a number of days if they don’t sell, because you’re right, week-old flowers won’t look great sitting in a grocery store. You should certainly ask people who have bigger accounts with bigger chains. But i general, I would say, don’t act insecure or nervous. Be strong in your assertion that these will sell, and it sounds like in this case, he’s waiting for you to set the terms. Take advantage of that! You also asked if they’re ever sold on consignment, and in bigger stores, not typically (I don’t think). Melisa: What are the top resources you would recommend for those beginning to learn floral design? Work for local florists. Offer to work for free, and then pay attention to everything they’re doing. I used to take Friday afternoons off from my old job (when I worked through the weekend) to work at a local florist. I did grunt work, but I learned. Offer to pay a local designer to walk you through their process. You don’t have to do a super fancy “1 on 1” with a famous person, just someone skilled and local. Check out online videos and try out the styles you see. I remember sitting in my living room with a few buckets of flowers, finding a video of a bridal bouquet being made and trying to replicate the exact shape, almost stem by stem. It was hugely helpful to try to encourage new habits. There are lots of online classes out there. I think it can be worth paying for one if the teacher’s style really resonates with you. Do some research and watch the freebies they offer, and see if you really get value out of them before you pay for anything. And then, practice and try new things. Learn a couple different styles for making a certain type of arrangement and practice all until you’re able to clearly see which one works for you (or until you find your own way). Shawna: What equipment is vital for brand new farmers? Say for 1/2 acre beginnings. You can get started with practically nothing. Number one for me would be irrigation setup. Anything that I leave to hand water, I’ll kill. Invest in some drip tape, a header hose, and a way to connect it to your water source. And don’t plant anything before you’ve got irrigation setup. Life’s too short to hand-water. You don’t need a full-fledged greenhouse, either. I’ve built low caterpillar tunnel for $50 - $100 depending on length and started all my seeds under there. Check out Bare Mtn Farm for details on how to build these. And you don’t need a cooler to get started, but you do need a cool place to keep your flowers. Figure out where that is and make it easy to access. I relied on the deep shade under trees for years, and then inside a barn. If you’re breaking new ground, you can pay for tractor work a few times a season and not have to invest in a tractor or BCS. Absolutely no need to buy one for half an acre. Shawna: What was your process for business branding, website, business cards, packaging in your beginning year/years? I didn’t think too hard about these things. I still don’t, to some extent. My logo isn’t great, my business cards look old, the name of my farm is a little confusing and I have to spell it for people, but I don’t really care. My work is good, which is what matters the most. More than anything I would recommend just HAVING business cards and a website. Make sure they’re clear, they say what you do, and how to reach you. I have put more work into my website lately (still a work in process). I’m actually quite obsessed with learning about SEO and Google Analytics lately. That’s a whole other topic. But the gist is, be thinking about who is looking for your product and why, and how you can help them. And make all of it clear. And then start collecting reviews on Google and maybe also on places like Yelp and Wedding Wire. You can also put these testimonials on your website. Roxann: What time management skills did you change/ implement after the first year was under your belt? Ooh good question. I tried first of all to get faster and more efficient at all my tasks (planting, harvesting, and weeding, namely). I also started paying close attention to where I was getting hung up and behind. For me I could usually manage to seed on time, but actually getting the transplants into the ground was another story. I would walk around from a big plant out mid-way through and not get the rest of the plugs into the ground for at least a week. I was also working a full-time job at the time, making things hard on all ends. I’ve since learned to hire more help for when I need it. It’s scary to think about hiring full-time, season-long help on the farm, but it’s not scary to have a few people on hand that you can call just for occasional big projects (like a big day of planting, seeding, transplanting, or harvesting). It’s insanely empowering to see how much a small crew can get done in a day instead of trying to do it all yourself. Theresa: What was the biggest surprise or concern you had in your first year, e.g., capital expense, customer challenges, time management/priority setting, farming inexperience? I had been running a vegetable (and some flowers) farm for three seasons, so a lot of the day-to-day farming stuff didn’t take me by surprise. BUT, I did have trouble with growing a good mix of crops, and with successions (what are successions, anyways?!). I would get really ambitious early in the season and plant a 100’ bed of Amazon dianthus, thinking that I was going to grow large amounts of everything and open up new sales outlets. But I got so busy that I missed round after round of sowings. That left me really relying on that 100’ bed, full of the brightest Amazon Neon Purple dianthus you ever did see. What is a tiny farm doing to do with all that dianthus? I remember bringing my main florist customer 20 bunches at a time and him eventually having to tell me to STOP. I had one long bed of snapdragons that bloomed almost all at once (in spite of being different varieties), and I couldn’t keep up. I think if I had tuned into my successions better, and hired a little help to keep me on track, I would have been able to have more steady sales throughout the season. Janet: Do you require wedding customers to use only your flowers or do you purchase from wholesalers and other farms also? I aim to use about 75% of my own flowers and buy in 25% for my weddings. This past year I had such a long wet spring without any beds prepared, that up through July or so these ratios were flipped. For what I buy, I’m normally able to source it from small farms I want to support that are within 20 or so miles from me (or from the Sonoma Flower Mart, where I both sell and buy, and it’s about a mile from my house). I can do this easily and, because my farm is now so small and sort of inefficient due to its scale, it’s probably cheaper for me to buy them in! (Do you all see why, in Sonoma County, I realized I could better make my living as a florist rather than a farmer)? When I really need to, I go down to San Francisco and buy other California grown flowers. They have a gorgeous selection down there. This may change over the years. The first year I did weddings I used only my own flowers (I think). My designs felt constrained, and I realized that as I try to elevate my work, I really love working with special flowers others have grown. I’m upfront with my couples about this, and they never care. Going forward, if I keep expanding my perennials in small patches and therefore greatly increase the diversity on my farm, maybe I could go back to growing all my own wedding flowers. Andrew: About suppliers. We do our research and typically find one company for each type of supply, i.e greenhouses, tools, field stuff etc. When it comes to seeds we see a lot of people buying seeds from many suppliers. Seems like a lot of extra talking, ordering and shipping costs. In the first few years is worth the time? Is it just about exclusivity of seeds or something more about germ rates? We just want to streamline right from the jump, we are in year 2 here in middle Tennessee! I’d say it’s about finding the varieties you want, for a good price, from a reputable source. It does seem impossible to get all the seeds you would need, that fit all these categories, from one source. So you’re right, it’s more work than sourcing other types of supplies. It’s worth a little bit of hunting. But if you’re organized and not hugely in search of weird stuff, you should be able to get all you need from 3 or so sources. For me this year, for example, I got seeds from Johnny’s, Geoseed, Ivy Garth, and Baker Creek. Unless you really can’t find something, I wouldn’t buy from some random source on google that you’ve never heard of (this is where bad germination rates, flowers that aren’t true to type, and other problems come into play).